You guys know I have never been able to master my sewing machine. And not for lack of trying. (Okay, fine, I didn't try very hard and pretty much gave up at the first sign of difficulty.) But, since I know I'm not alone in this struggle, I decided to share how I make most of my pillows...without a sewing machine. A little while ago, I came across some fabric glue called Unique Stitch and decided to give it a try, figuring nothing could be worse than fumbling around with a bobbin for an hour. And as it turns out, this stuff is great. I've tried fabric glue before, but it never delivered and usually left me wanting my $5 back. This stuff is different. It totally delivered. You can even wash your pillow covers after using this stuff on them, and it still holds strong. It takes a little longer to dry than some of the other fabric glues, but the end result is much better. You can find Unique Stitch at most craft stores or online here (amazon affiliate link). I ended up making a bunch of different pillows, some for the guest bedroom I'll share next week, and some for the living room. I'm pretty happy with how they turned out. Cost me about $3 a pillow. So, here's a quick pillow tutorial. You need fabric. I was able to get 2 pillows out of 1 yard of fabric, so buy accordingly. You also need scissors and of course, the fabric glue. 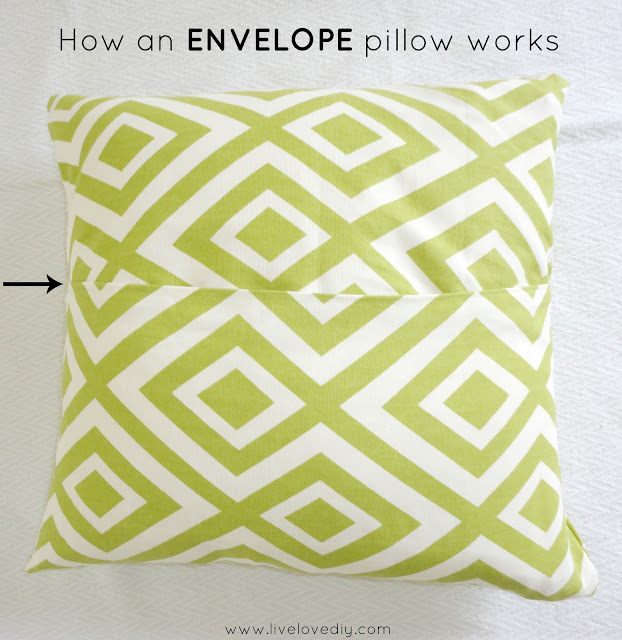 To make an envelope pillow, you need to cut 3 pieces of fabric. I cut one 20x20 inch piece and two 20x15 inch pieces. The two 20x15 inch panels combine to make the backside of the pillow, overlapping slightly in the center, with an opening in the center (where the green arrows are) that the pillow goes into. Here's a diagram to show you how it works. To assemble your pillow, place the two 20x15 panels on top of the 20x20, matching up the numbers in the diagram. The black arrows show you where to glue the fabric to attach the panels to one another. I chose to run a strip of glue along the edge on the two 20x15 panels where the green arrows are and fold the fabric over so that they look finished and so that I didn't have any raw edges of my fabric showing. Also, since you are assembling this pillow inside out, lay the fabric with the print facing inward. When the pillow is assembled, the two 20x15 panels end up where the pillow opens in the back, slightly overlapping. This is what the back of your pillow will look like. 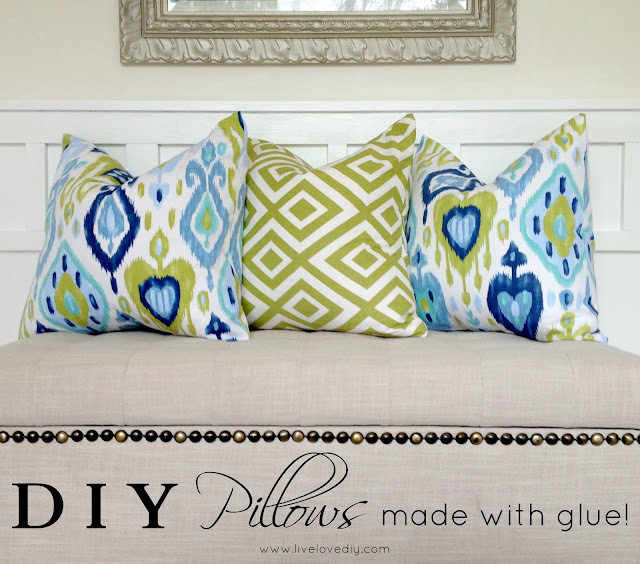 Once you've glued your pillow cover together, allow it to dry overnight. 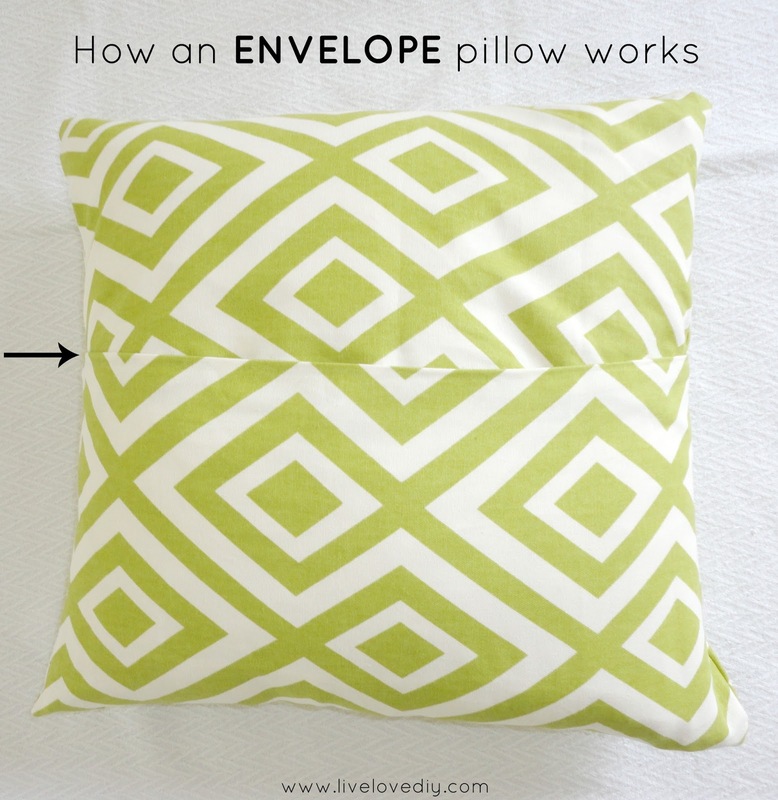 Once it's dry, you can turn your pillow cover right-side-out and stuff your pillow in the opening. I like to use down alternative pillow inserts because they fill the covers out really nicely. Want more? For more budget decorating ideas, check out my top 50 here. Um, why didn't you tell me about this fabric glue like ten YEARS ago?!! I can't wait to try this! Can you tell me where you got that ikat fabric or what it is called? Hi Lisa! I'm not sure what it was called, but it was from Joann's fabric! I'll find out today and try to include it in tomorrow's blog post about fabric tips! A girl after my own heart. I love no-sew projects. And, your pillows turned out great!! Thanks so much Denyse! So glad you like it! Thanks for stopping by! COLOR! Cute stuff from such a neutral girl. Love the ikat print. And the pillows look so professional....better than ones I have tried to sew with an actual machine! YES! I can make a bed, work a saw, drill screws, but sewing...nope. Thanks sharing. I will definitely be bookmarking this tutorial. I hate sewing. Well, mainly because I dont know how, lol. Yay! The dimensions make much more sense now - I'm going to be trying this over the weekend! Thank you! PS - did you use 18" pillows or 19" ones? :) Thank you! Yes! I was about to type the same question... and how far in did you place the strip of glue? about an inch or so? 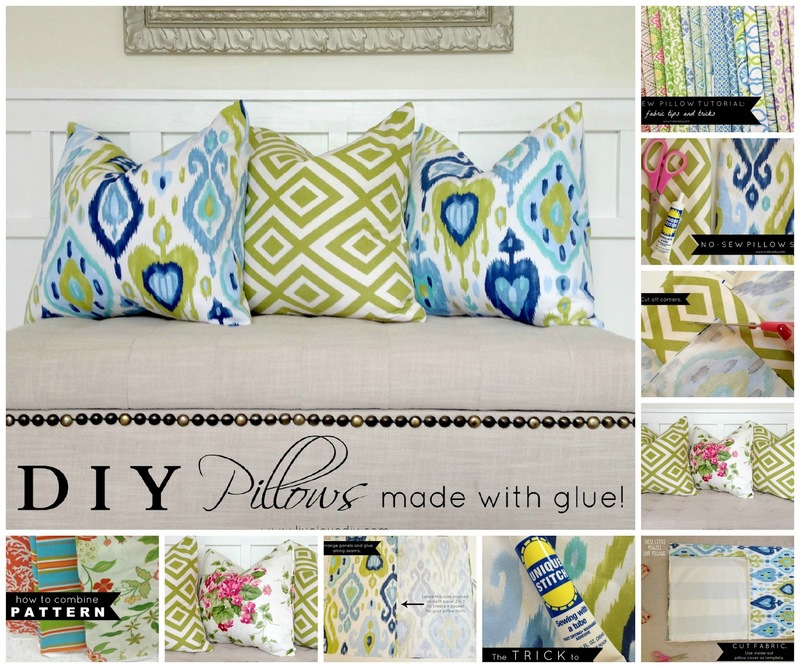 I love the pillows....and even more so, the fabric choices! Adorable! Thank you so much for revising and adding the diagrams and new pics- now I totally get it! Love, love, love your blog! Can't wait to make these! 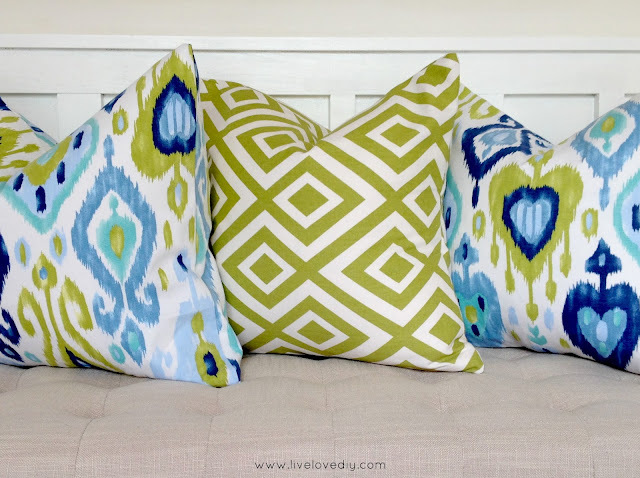 If you have different patterns with your pillows on the sofa what do you do about curtains? Do you need to have a solid curtain, or is it ok to have a print there as well? I LOVE your fabric choices. The finished pillows are striking! first time visiting from a link I stumbled upon on FB. 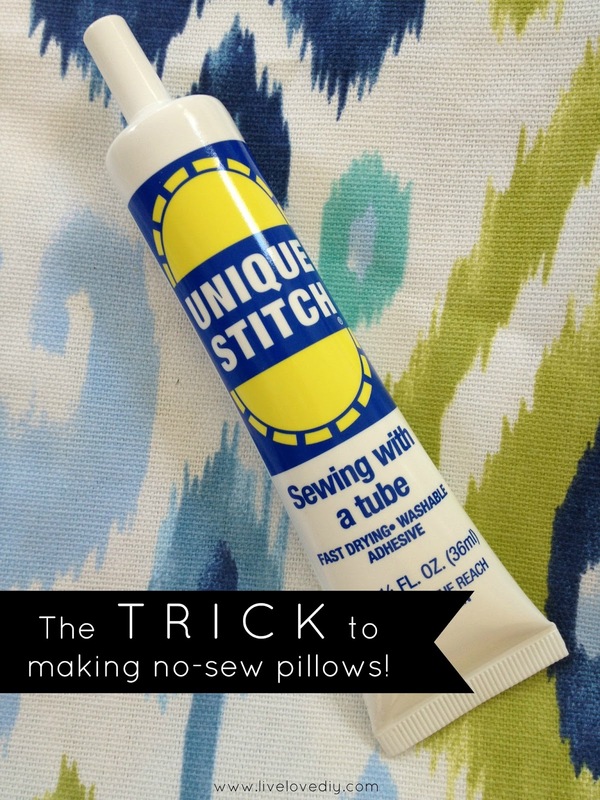 I didn't even know this "no-sew-glue" product existed. 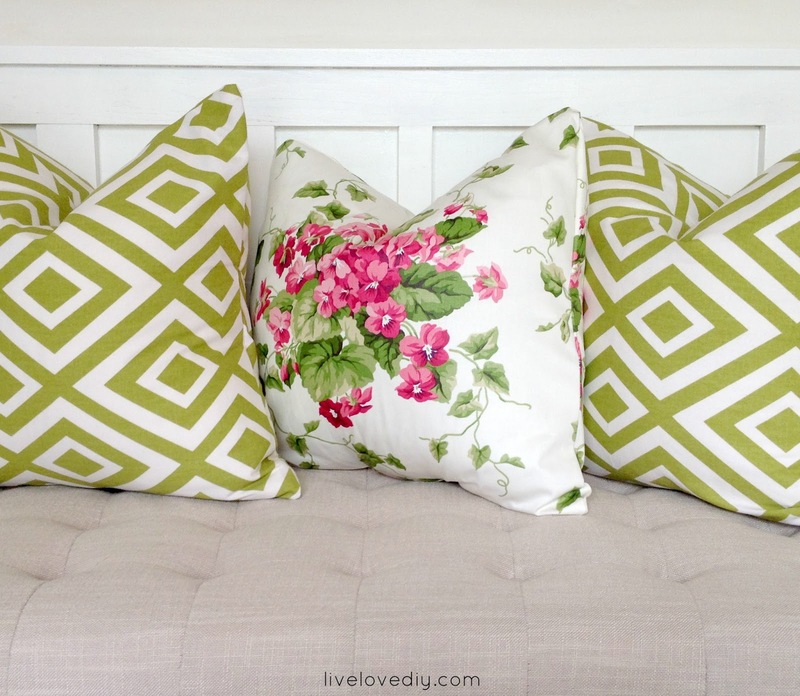 Great post and I love the way your pillows look. Your fabric choice is stunning! I actually laughed out loud when I saw the "supplies" pic. I cannot believe I haven't found this glue yet. I am still in awe of the tape stitching. This is beyond! 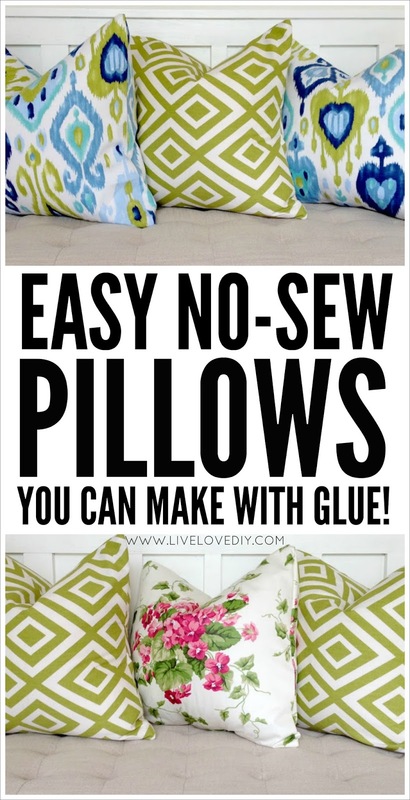 Thank you for the easy tutorial on making the pillows too. I thought I already had an easy pillow kinda way, but this it really great. Thanks again! I pass up so many crafts because i can't sew and now I am inspired to make sooo many pillows. Thanks for sharing. What siza down pillows did you buy to fit these fabric measurements? Where do you get your pillow inserts? Good feather inserts can be expensive. I really like the outdoor canvas material at Joann's. Will the "Unique Stitch" work on that material too? Or what materials are best? (only cotton or what?) Sorry- I am such a newbie at this! Dear Virginia...... you did it again...! Since I found your blog I've attempted (and sometimes achieved...!) many of your great budget decorating ideas. My mother was a dressmaker, but for some reason she never managed to teach me how to "Dressmake" but I've managed to teach myself the most basic of sewing in my old age....(73)..! These are awesome. Have a question: If I use 22 or 24 inch inserts, What would the dimensions of the pillow pieces be? Thanks!! i love this so if my pillows are 29 by 29 i should cut a 29 by 29 front piece and 2 29 by 15 oieces for the back? I'm having a hard time with the raw edges. Do you think it's my scissors or the fabric? Any suggestions? Thank you so much for this! I can't wait to peruse more of your blog! I'm glad I'm not alone in my misery. I've killed at least four sewing machines. I mean KILLED them. I also hate the word bobbin and I'm sure if they could talk they would tell you they hate me even more. My mother also made beautiful clothes for me growing up but I have neither the patience or skill. I keep thinking of taking a sewing class and maybe I should, just to show those sewing machines who is the boss. Ha! Unique stich is awesome! I used it to adhere lace all along the edge of my wedding veil. It would have been a disaster trying to use the machine. Oh, and I seem to have just lost a good hour or so perusing your blog. So many great tips in one place! Thanks! I was just giving myself a pep talk about getting my sewing machine out and figuring out how to use it again when i found your no sew pillow. thank you thank you thank you!!! question: can I use this technique with rayon silk velvet? i just bought some small pieces on ebay. thanks! Wow, this is fabulous! I don't know how to sew and hate spending money on pillows. I need to update or sofa pillows, though, and was planning on using the fabric tape that you iron on. This gives me a GREAT new idea! Thanks for sharing. HI! I, by some force of God/fate/magic came across your blog tonight and I can't stop reading it! It gets me so excited. I get so frustrated by blogs that show off amazing DIY things and redecorating ideas that are still too, too expensive for a newlywed couple. And I really really can't sew, even though my mother also made many of my clothes when I was growing up (as the only daughter, I was her doll, haha). 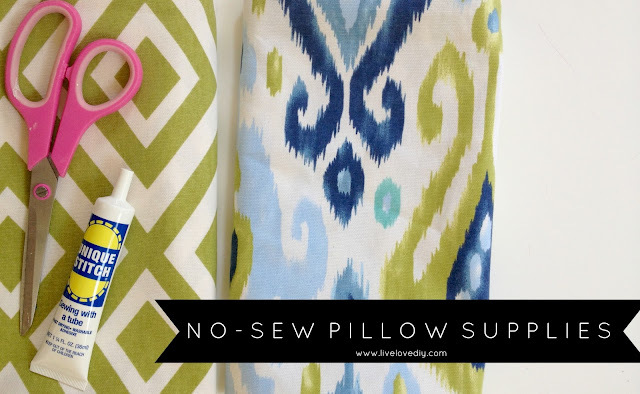 So your blog is a lifesaver and your cushion tutorial is amazing because I've been dying to buy more cushions for our sofa and they're just TOO PRICY! Anyway, I've probably drooled enough so to my point! I followed your link to the velvet throw pillows and WOW, so I was wondering if you have any links/tips for buying/making inserts for throw pillows. Thanks so much!! Like Saosan above, I too just found your blog through Pinterest and have been pinning away & reading your blog for the past hour! Your tutorials are amazing & I love your style! I commend you for keeping things truly low cost and I am so excited to paint my ugly maroon shower tiles & my 80's fruit tiled kitchen backsplash after seeing how great your tile countertop in your kitchen turned out. I was also wondering about tips or links for buying or making inserts for throw pillows. I know you said in your tutorial you like to use down alternative, but do you have a certain store you buy them inexpensively? Thank u so much for this awesome tutorial!!! So.. I have a question, couldn't I just use one piece of fabric, fold it over so it overlaps in the back, then glue (GENIUS btw) the open ends together? Where do you get your fabrics as seen in this pillow tutorial? I am looking to find fabrics that look just as nice... and because I know you are a frugal fanny I know it didn't cost you an arm and a leg... hope to hear from you soon!!! This is an awesomely easy project, can't wait to do it. Hi Virginia! I love this idea! My boyfriend and I would like to update an old couch by adding new pillows (we don't want to buy a new one just yet). Would I be able to use the old pillows as my inserts? They are 24x24, so new inserts would be pricey. The current fabric is a little dark, so I'm worried the old colors may show through the new fabric. Any ideas? Thank you for your help and your wonderful blog! I will be sharing my pillow on the Goodwill of Akron blog (I used thrifted fabrics to make it) and made sure to mention your blog and link. It won't be live 'til next week, but I'll stop by again and give you the link to it if you want to check it out! They look very pretty and perfect! Thanks for the great tutorial..I ended up making 3 of those.. super easy!! (http://stylemyabode.weebly.com/blog/no-sew-cushion-covers) Now I don't have to keep searching for my dream pillows... :)) I used Iron on hem tape instead of glue..I even had one of them machine washed and dried with no issues..
Great Tutorial!!!!!! Would you happen to know the measurment of your pillows before you added the case? I love this tutorial - so clear and well written, thanks so much for sharing. I had to laugh while reading your post as I feel the same way - mum made all my clothes as a kid but I hate sewing. But, I have to wonder at the price of the glue you used- seems very expensive for a small tube. I think I will test and try to find something less expensive.